PE Creative: It flies, it really flies...! It flies, it really flies...! We recently completed a direct mail piece for our telemarketing partners CPB. 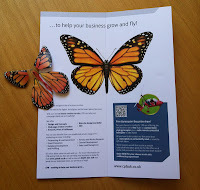 This mailer is designed to create an impression...it has a flying butterfly which delights and shocks the recipient! We wanted to promote CPBs new creative division (of which Jonny is the Creative Principle) so it had to be good. Luckily CPB agreed to roll this idea out the results have been very promising. With some very good feedback and some possible work in the pipeline. 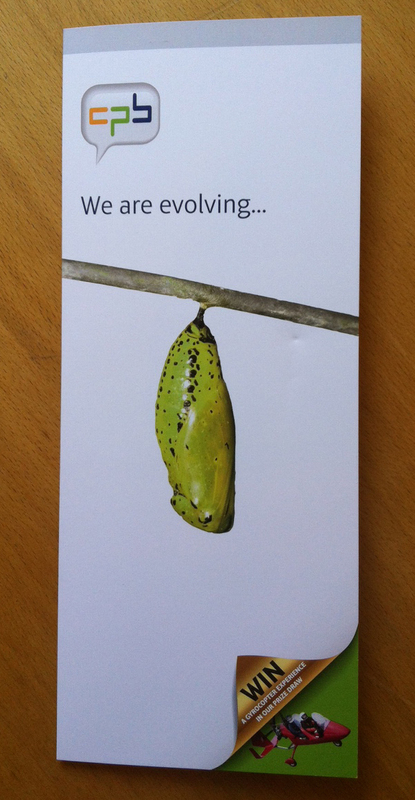 The theme being "We are evolving" the idea underpins CPBs move into the creative sector which enhances their client proposition. if your business needs an injection of creativity then give us a call on 01332 29114 to see what we can do for you...it would be great to help you.